Compliant Pesticide Storage Facilities - Gain Compliance Here! Pesticide storage, distribution, sales, and the use of pesticides, in the United States, is governed by the Federal Insecticide, Fungicide and Rodenticide Act (FIFRA). Compliant pesticide storage practices can vary by state so it is necessary to contact your state’s Department of Agriculture or Department of Natural Resources to learn more about how to stay compliant. US Chemical Storage is dedicated to keeping your pesticide inventory safe, secure and compliant with our 100% compliant pesticide storage facilities. Compliant pesticide storage facilities by US Chemical Storage offers safety, security and compliance. Compliant pesticide storage facilities offer a safe storage atmosphere for maintaining inventory, while keeping the environment protected. Pesticide storage facilities by US Chemical Storage are completely sealed and feature a leak-proof secondary sump containment for securely maintaining spills, leaks or other pesticide storage accidents. 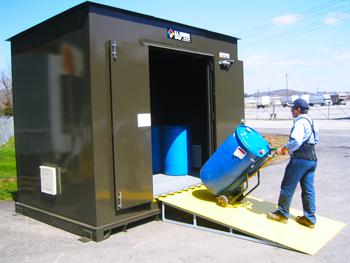 These compliant pesticide storage facilities are built for protection, security and safety. Customize your pesticide storage facility with mechanical ventilation, alarm systems, passive ventilation, cooling systems, heating systems, liquid level sensors, gas detectors, forklift entry doors, ramps and more. Designed to keep you, your personnel and the environment safe and protected. Compliant pesticide storage facilities by US Chemical Storage meet EPA, OSHA, NFPA and FM or Warnock Hersey approvals. US Chemical Storage compliant pesticide storage facilities come with a 15-year structural warranty and an epoxy top coat, inside and out, to protect your pesticides from extreme weathering conditions. These custom facilities are designed by professional engineers and tested before leaving our factory to ensure a high quality and 100% compliant storage solution. Illustrated below is a list of safe pesticide storage practices for maintaining personnel and environmental safety. Manage proper facility temperature with exhaust fans or ventilation systems. Do not transfer pesticides to unauthorized containers, or drinking bottles. Place your compliant pesticide storage facility on a level ground where flooding is not possible. Avoid stacking pesticide storage containers. This can lead to spills, leaks or hazardous accidents. Do not store pesticides near foods, including animal feed. Always properly label pesticide storage containers before transferring to your compliant pesticide storage facilities. Securely lock your pesticide storage facility from unauthorized entrants. Implement proper temperature controls to maintain a safe internal storage atmosphere. Contact local officials if you cannot identify the container’s contents. When mixing or dispensing pesticides use proper protective equipment. Store only necessary amounts of pesticides. Use shelving or racks to store large quantities of pesticides.